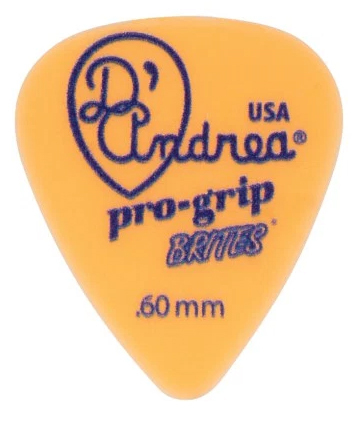 D’Andrea USA’s Pro-Grip Brites are molded Delrin picks with an alternative material that addresses the issue of pick slippage. Each pick is made with the ever-popular delrin/acetal material and is carefully designed and manufactured for maximum memory and minimum wear that made the original tortoise shell famous. These picks are similar to our traditional 351 Shape, but slightly customized with a sharper point. The string striking surface provides players with an alternate means of articulation and expression without compromising the familiar feel of the 351 Shape. Proudly Made in USA! $15.95 For an even lower price, add to cart.